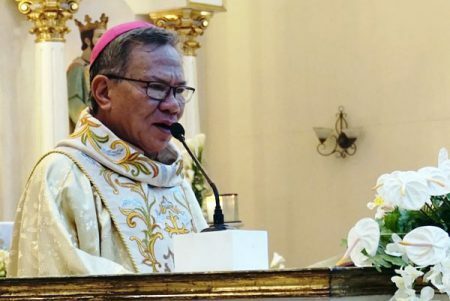 He should be celebrating over his new position, which he took over from Archbishop Cardinal Quevedo, who recently retired.COTABATO CITY – Archbishop Angelito Lampon of the Oblates of Mary Immaculate had mixed feelings when he assumed his post as head of the Archdiocese of Cotabato. But when Lampon was installed on Monday afternoon, by the Papal Nuncio, Archbishop Gabriele Giordano Caccia, it was just a day after two bombs went off at the Cathedral of Our Lady of Mount Carmel, killing 21 people and wounding at least 111 others. “I have a heavy heart, and this heart is bleeding for my people who perished in the Jolo cathedral bombings,” Lampon said in a brief interview after his installation. Lampon had served in that cathedral for 21 years, regularly celebrating the 8:00 a.m. Mass. 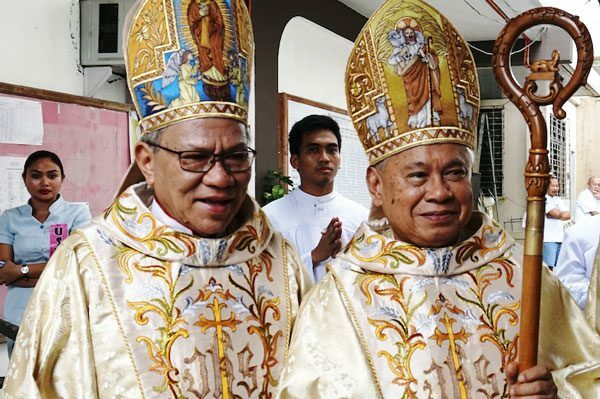 But last Sunday, a diocesan priest took over because Lampon was in Manila attending a meeting of the Catholic Bishops Conference. “It’s a big emotional upheaval inside and yet my faith tells me to continue extending a hand of friendship, in inter-religious dialogue,” the new archbishop said, his eyes slowly turning red. Still grieving for his flock, Lampon said the Oblates and the Catholic Church would not be cowed by the violence. 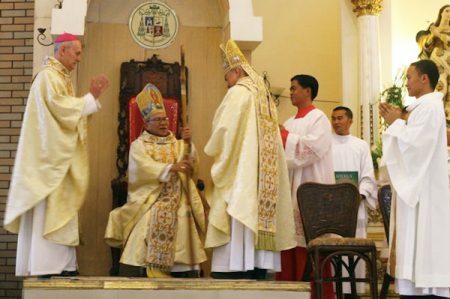 Jolo’s Bishop Emeritus, now Archbishop of Cotabato Angelito R. Lampon, OMI (L) beside Cardinal Orlando B. Quevedo, OMI, shortly before entering the Immaculate Conception Cathedral in Cotabato City for Lampon’s installation on 30 January 2019. MIndaNews photo by GREGORIO C. BUENO“I have a heavy heart, and this heart is bleeding for my people who perished in the Jolo cathedral bombings,” Lampon said in a brief interview after his installation.